I can't think of a better way to start your weekend off right than playing. ​Come unwind and have some fun. MASKS Date has been changed to July 15th. These will be hands-on interactive workshops. You will be playing with new mediums and materials, and hopefully having a lot of fun getting messy, experimenting, and getting outside of your comfort zone. I want to encourage you to try new things. It's okay to be a beginner and this is not about knowing how to do things. These workshops are all about exploring and discovering, and who knows what you may end up loving! Note: Minors whose parents believe they will be able to participate appropriately are welcome to attend, accompanied by a parent who is also participating. Play books: These are great resources on the importance and power of play and some quotes from them. "The people who are going to be the catalysts of change will be the steadfast, nurturing weavers of wisdom; the illuminating, passionate painter of purpose; and the encouraging, persistent handcrafters of hope. The world needs you to play." ​time flies, so do I"
"Ultimately, this book is about understanding the role of play and using it to find and express our own core truths. It is about learning to harness a force that has been built into us through millions of years of evolution, a force that allows us to both discover our most essential selves and enlarge our world. We are designed to find fulfillment and creative growth through play." -S.B. "Play is called recreation because it makes us new again, it re-creates us and our world." -S.B. "When we stop playing, we stop developing, and when that happens, the laws of entropy take over-things fall apart. ...When we stop playing, we start dying." -S.B. "Play is a state of mind - it's a way to approach the world. Whether your world is a frightening prison or a loving playground is entirely up to you." -C.H. "Play is the creator of joy. It's the source of fun and love, where our subconscious naturally guides us. Play is the state where we are truly ourselves, once we let go of our egos and fear of looking stupid. It's what facilitates our best friendships, our most treasured memories, and ultimately, our enjoyment of life." -C.H. "When I started viewing my life through the lens of Play, my world changed. I got rid of all the things that made me unhappy. I went outside and had guilt-free fun with my friends. All of my interactions became a dance. My inner joy shined through the smile on my face, and people reflected my playful energy right back at me." -C.H. "If we want to live a Wholehearted life, we have to become intentional about cultivating sleep and play, and about letting go of exhaustion as a status symbol and productivity as self-worth." -B.B. "If you're wondering why play and rest are paired together in this guidepost, it's because after reading the research on play, I now understand that play is as essential to our health and functioning as rest." -B.B. Mandalas are all about wholeness. The circular nature of them is to help us incorporate all parts of ourselves and embrace our imperfections. I love them for relaxing and have many mandala coloring books (which I will bring so you can see) since I started coloring before adult coloring was a fad and they now have coloring books that aren't Mandalas. -Bonus: Take-home mandala pages to use on your own. All supplies will be provided and you get a few zentangle tiles and a micron pen to take home. Are you ready to have some fun and release your inner child? There is nothing like finger painting to really help you let go. Please, bring your fingers of course, but in edition to those I will have lots of fun non-brush mark making tools for you to try out and use. A canvas will be provided for you along with all the non-brushes and paints. Are you getting excited yet? We are painting so make sure you wear clothes you are okay if they get paint on or bring an apron/art smock. See you there! "Most adults have already had some childhood experience with sand, either at the beach or in a sandbox. Therefore, sandplay serves as a link to, or a reminder of, past experiences and creates a doorway to the realm of childhood." ​Just like at Halloween I never give away what my costume will be, come be surprised at how we will be playing with masks. There will be lots of creative ways to make and play with masks, and I hope you will come express yourself with us! 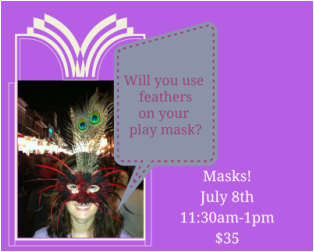 ​A guided surprise mask making activity and then time to create a mask of your choice out of many different material options. Are you ready to Build Creativity? I've been building with bricks all year and am excited for you to join me for a day as I guide your through some creative experiences with and without a LEGO® Kit. Everyone will receive their own LEGO® Creator Kit. I will also have lots of bricks but if you have your own stash of bricks please feel free to bring them for the individual creation time. ​Are you ready to see the wold differently? There will be bubbles, story telling, and creative prompts for you to experience and see more wonder and beauty in the world. I will lead you through some guided creative exercises with photography and then you will have some time and options to explore and play on your own. Please bring a small object with you that has a meaningful story you would like to share. All and any cameras are welcome - phones, point and shoot, DSLR. Time to pound, shape, and have some fun with clay. We will be working with non hardening model clay and all supplies are included. Guided creative exercises to allow you to experience clay in fun new ways. We will be using it as a medium to experience our creative selves whether that's through pounding it out or shaping it into something that is meaningful. ​Come color outside the lines. This was one of the first activities I learned in an introductory art therapy workshop and I loved the freedom and play involved and often use them. We will get loose and discover what our drawings are showing us or have to say to us. There will also be some other ways to play with scribbling using pipe cleaners and yarn. Let's Celebrate the Magical Play 2016 Workshops with a PARTY! Get ready to have some laughs as this is not about drawing ability but having some fun. Take a chance and see what you can do as we experiment with all different types of portraits and speeds.